SANTIAGO, Chile (CNS) — The beatitudes are not cheap words for those who think they know it all yet do not commit to faith; they are the fruit of a hopeful heart that yearns for peace and happiness, Pope Francis said. Christ’s response to the longings and aspirations of those seeking a life of happiness are not a “product of those prophets of dooms who seek only to spread dismay” or “mirages that promise happiness with a single ‘click,’ in the blink of any eye,” the pope said Jan. 16, celebrating his first public Mass in Chile. “The beatitudes are born of the compassionate heart of Jesus, which encounters the hearts of men and women seeking and yearning for a life of happiness,” he said. 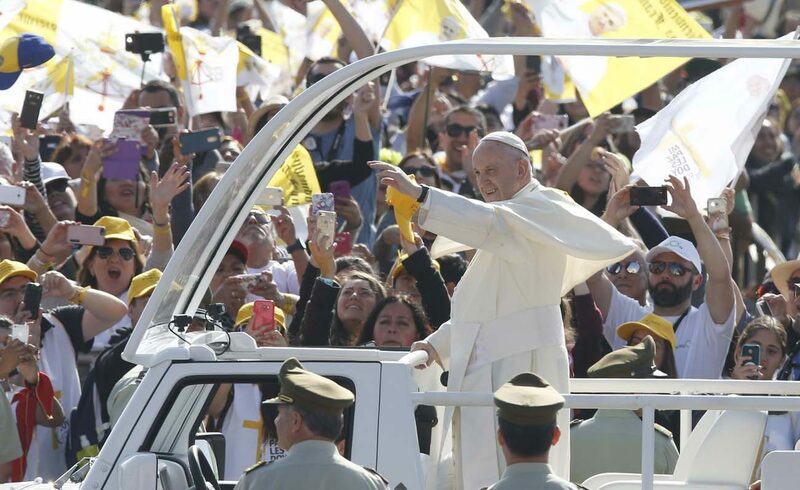 A sea of yellow and white flags waved throughout O’Higgins Park as Pope Francis arrived in his popemobile, greeting the estimated 400,000 people. By the middle of the Mass, it was 82 degrees. Pilgrims shielded themselves from the sun with ball caps and sun hats. Despite several acts of vandalism and protests against the pope’s visit that made headlines in the Chilean capital, there was an atmosphere of joy and hope as crowds sang a traditional Latin American hymn welcoming the pope. “Together like brothers, members of one church, let us go walking toward the Lord’s encounter,” the faithful sang. Reflecting on the Gospel reading from St. Matthew, Pope Francis said Jesus’ proclamation of the beatitudes is the answer to those who seek an encounter with him. “Those faces awaken God’s visceral love. Jesus’ heart was not moved by ideas or concepts but by faces, persons. By life calling out for the life that the Father wants to give us,” he said. “This is the heart to which Jesus speaks; that is the heart for which the beatitudes are meant,” the pope said. “This is the only way we must forge a future of peace, to weave a fabric that will not unravel,” Pope Francis said. Among the bishops concelebrating the Mass was Bishop Juan Barros, whose appointment as bishop of the Diocese of Osorno sparked several protests ahead of the pope’s visit. Bishop Barros’ former mentor, Father Fernando Karadima, was sentenced to a life of prayer and penance by the Vatican after he was found guilty of sexually abusing boys. Santiago’s metro opened early for pilgrims to attend the Mass. At O’Higgins Park, people from all over Chile arrived by bus hours before the Mass. Pope on horseback kept pilgrims orderly. Many pilgrims lined up to buy souvenirs — flags, bags, key rings and photos featuring Pope Francis. One Chilean woman, who identified herself only as Claudia, was there with husband and four children, ages 13, 8, 3 and 1.